Small cars don't always get the credit for innovation that they deserve. We're used to the idea of design features and technologies being trailed in big and expensive cars then filtering down to less opulent vehicles over time but we often fail to appreciate the ingenuity and original thinking that debuts in models from the littler end of the spectrum. In many ways, it's harder to be inventive at this lower level because the cost constraints are that much tighter but that didn't stop Mitsubishi from pulling out all the stops with its i car. It's worth pointing out at this stage that the i car was an independent venture undertaken by Mitsubishi and had nothing to do with Apple, the purveyors of the iPod, iPhone, iBook, iPad and goodness knows what other similarly prefixed products by the time you read this. In fact, it was a mild surprise at the time that the Japanese manufacturer managed to get a product called the i anything to market at all without intervention from Apple's legal team. The i was a long time in development. The first public glimpse of the car came with the unveiling of the i Concept at the 2003 Frankfurt Motorshow but little attention was paid to the car because its futuristic looks smacked of a designer's flight of fancy that would never see a production line. If anything, the second prototype, dubbed the Se-Ro and unveiled later in 2003, was even weirder Mitsubishi clearly thought there was something in it. Almost three years later, in 2006, the i went on sale in Japan to considerable critical acclaim but it was 2007 before anyone could buy one officially here. As a four-seat, five-door city car with rear wheel drive and a rear-engined layout, this isn't exactly a conventional citycar. In 2007, the Smart ForTwo was the height of small car quirkiness but the i made that look like a diesel Ford Mondeo with its unorthodox thinking. Pricing always seemed high compared to other city car options and by 2009, the i had disappeared from UK showrooms in its original form. 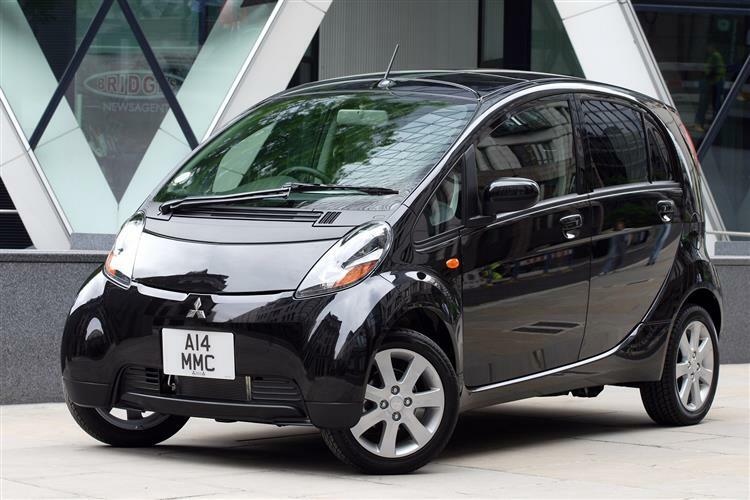 The car did live on however because it formed the basis for Mitsubishi's i-MIEV electric vehicle which was launched in 2009. The i car makes great use of the available space but there isn't very much of that within the confines of this diminutive vehicle. Four adults can fit in for typical city journeys and there's even a usable boot, although the i isn't really cut out as a family car. The rear seat back splits to allow larger objects to be carried but with the engine under the boot floor and back seats there isn't a huge capacity. Heat rising from the engine bay can also make the boot rather warm - great for takeaways, less so for your frozen chicken. The egg-shaped profile and wheel-at-each-corner stance of the i makes it stand out on the road. That's likely to suit buyers who want to drive an environmentally-friendly vehicle and would also like everyone else to know that they're driving one. General build quality is reasonably tough but the plastics don't feel very expensive and the interior is less attractive in its design than the outside. Just one model was offered to UK customers and it's reasonably well equipped with climate control, a six-speaker CD stereo system, electric windows all round and electrically operated and folding door mirrors. The i also offers the novelty of Oeko-Tex Standard 100 certified hypoallergenic seat fabric. Working with a deodorant roof lining and a clean air filter, this fabric apparently helps purify the cabin. Safety wasn't ignored in the quest for compactness as there's standard anti lock brakes with electronic brakeforce distribution, twin front airbags, ISOFIX child seat mountings and anti-trap windows. The urban environment where the i is designed to serve can be a harsh one. Be on the look out for dents, scuffed wheels and parking knocks that have been picked up. Mitsubishi has a good reputation for reliability so the mechanical side of things shouldn't be a problem. The low numbers of i cars circulating in the UK might make parts difficult to come by but the car was designed to be cheaply repairable so costs shouldn't be extortionate. It's a beautifully easy car to drive. There's no clutch pedal in the i and an INVECS-II four-speed automatic transmission offers press and play accessibility. The engine is a tiny 660cc three-cylinder unit and while the front end of the car looks as if it's run into the base of a generously proportioned oak, you'll look in vain under the concave bonnet for any signs of motive power. The turbocharged and intercooled unit instead sits to the rear, cradled within an aluminium spaceframe chassis. The published performance figures are 0-50mph in 11.2 seconds and a top speed of 90mph but if you want the more usual 0-60mph performance, independent test indicated that it's a slow 15s. With 64bhp to propel it up the road it's fairly eager to step off the mark and the 93Nm torque figure is developed at a relatively low 3,000rpm thanks to that turbocharger. A tiny turning radius of just 4.5m is testament to that wheel at each corner design. It's incredibly easy to place the car very accurately because of this lack of overhang, front and rear and parking is a doddle. Economy is good but not remarkable by modern standards. An average fuel consumption figure of around 55mpg shouldn't be too far wide of the mark but there are plenty of small diesel-engined models of similar age that will do better. Mitsubishi made a bold move in bringing its deeply unconventional i car to market. It was always destined to sell more strongly in Japan where government legislation made small petrol cars more cost-effective to run but its inherent quirkiness brought it a loyal band of followers over here. It's extremely easy to drive with buzzy engine and automatic gearbox and excellent in tight urban settings. It can cope with the open road too but this isn't its preferred environment. Lots of equipment is fitted as standard but the i doesn't quite have the economy that its eye-catching looks suggest. In the end, it's the looks, the manoeuvrability and the novelty value that will attract used buyers.